^ 7.0 7.1 Hart, Basil H. Liddel. A History of the Second World War. London, Weidenfeld Nicolson. 1970: 627. 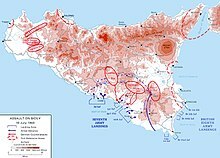 ^ 8.0 8.1 Ufficio storico dello Stato Maggiore dell'Esercito (USSME). Le operazioni in Sicilia e in Calabria. Rome. 1993: 400-401. Field Marshal Lord Carver. The Imperial War Museum Book of the War in Italy 1943-1945. London: Sidgwick & Jackson. 2001. ISBN 978-0-330-48230-1. Grigg, John. 1943: The Victory that Never Was. Kensington Pub Corp. 1982. ISBN 978-0-8217-1596-3. 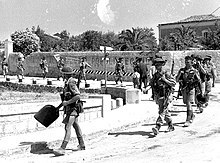 Canadians in Sicily, 1943 Canadians in Sicily: Photos, battle info, video footage and newspaper archives.